Fern Hill Nursery and Botanical Sanctuary is a member of the United Plant Savers Botanical Sanctuary Network (UpS). UpS is a national organization dedicated to the preservation and cultivation of at-risk native medicinal species. 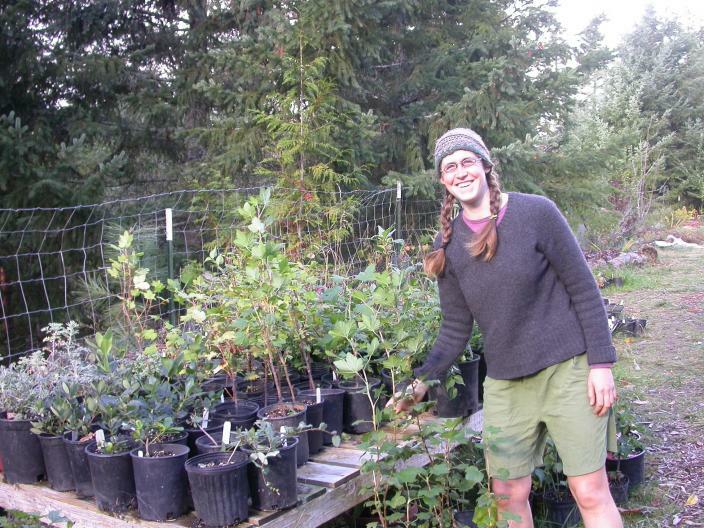 United Plant Savers' mission is to protect native medicinal plants of the United States and Canada and their native habitat while ensuring an abundant renewable supply of medicinal plants for generations to come. Fern Hill Nursery and Botanical Sanctuary is nestled in the Southern Willamette Valley of Oregon, between the Coast and Cascade mountain ranges. The land ranges 500 ft in elevation , encompassing 52 acres of diverse native forestland. Stands of native medicinals have grown wild on the land for many generations including: woods Oregon grape (Berberis nervosa), tall Oregon grape (Berberis aquifolium), cascara sagrada (Rhamnus purshiana), red root (Ceanothus cuneatus), trillium (Trillium ovatum and T. albidum), and yerba buena (Satureja douglasii). We have also introduced many medicinals to our forest and cultivated gardens including: yerba mansa (Anemopsis californica), white sage (Salvia apiana), goldthread (Coptis lanceolata), coneflower (Echinacea purpurea), nettles (Urtica dioica), and black cohosh (Cimicifuga racemosa). We are beginning to develop native “nurse” beds in the forests and meadows according to the needs of specific natives. We hope to divide and propagate by seed from these individual beds. Our intention is to spread the plants throughout our sanctuary more effectively and also have extra to share with fellow native medicinal plant enthusiasts. We are increasing the biodiversity of our land by using non-toxic, non-mechanized management techniques. We propagate plants like Oregon grape (Berberis aquifolium) into patchy forests, yampah (Perideridia gairdneri) under oak groves, balsam root (Balsamorhiza deltoidea) onto exposed slopes, large camas (Camassia leichtlinii) and mule’s ear (Wyethia angustifolia) into wet meadows. We found that by smothering the competitive and exotic tall meadow fescue (Festuca arundinacea) with mulch, natives like the harvest brodiaea (Brodiaea coronaria) poke up from underneath! This season, we have begun experimental burning with hope that we can suppress exotics so the natives may thrive again. We love to share the sanctuary by offering tours of the land and nursery and leading herb walks at our seasonal open houses. We are preparing to teach over fifteen workshops throughout 2009, with topics including native plant restoration, medicinal herb cultivation, and native food and medicine plants. Away from the Sanctuary, we like to do outreach. We sell native and medicinal plants from our nursery at the local farmer's market. It’s a great time to interact with the community and answer questions about our land and what we grow. We offer landscape design and consultation for urban and rural people interested in incorporating more native and useful plants at their home. Our goal as land stewards and members of the UpS Sanctuary Network is to play a positive role in developing our own culture and the land into a more diverse, productive, and integrated ecosystem. We believe that through careful observation, biological awareness, engaged monitoring, and thoughtful management practices, we can tip the balance of ecological succession in a direction that benefits wildlife, increases biodiversity, promotes food and medicine production, builds soil, and deeply engages us as humans living on earth. We like to live and work as an example of what is possible and invite others to learn, share, and enjoy with us! We welcome you to visit us in person!